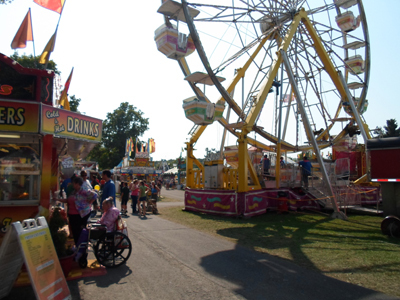 County fairs: brash, gaudy, exciting and just a bit dangerous. Ours was held over Labor Day weekend, neatly capping off the summer season. 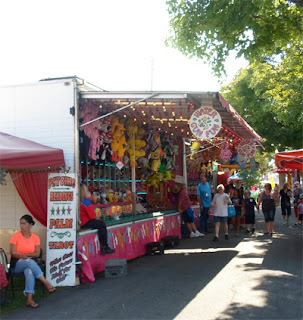 Before the fair, hot, sultry summer reigned, filling our lazy days with the buzz of insects, hot dogs, swimming in the creek and visits to the local ice cream shops; after the fair, school resumed, the seasonal shops closed and the nights grew long and cool. For me, the fair was summer’s exclamation point. Officially dubbed the Columbia County Fair it is commonly known as the Chatham Fair and universally referred to as “the fair” among us locals. It was the genesis of many a cherished childhood memory and one of the reasons I wanted to visit America when we did. The ephemeral nature of the fair made it mystical. Throughout the year the fairgrounds remained barren, then the trucks would arrive and, in an explosion of chaotic fury, the fair would appear. It opened Thursday and ran until the end of the Monday holiday. The last revelers left at 11 PM and when dawn arrived, the fairgrounds would be empty again. It was magic. 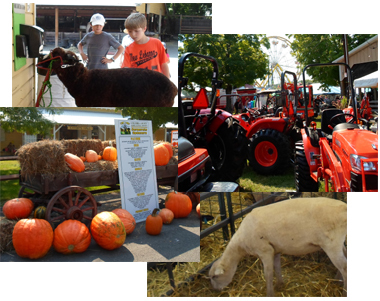 It's an agricultural fair, what did you expect? The fair shook the summer lethargy out you: the blaring music, the shriek of metal, the sticky, sweet scent of cotton candy and the pervading stench of diesel exhaust slapped you as you walked in. The air was hot, dry and dusty, the rides dizzying and at night, the lights blazed in unabashed, gaudy glory. Along the perimeter were the gaming booths, with their impossible odds and lame prizes and barkers who cajoled, flattered and insulted until you skulked out of earshot or gave in and put your money down. On the far end were the side shows: the bearded lady, the snake man, the world’s most fearsome gorilla (it was a guy in a monkey suit; cost me $1.50 to find that out), the boy with no body (a kid standing in a pedestal with his head poking through the top; $1.50) and, of course, the huchie coochie shows (“She walks, she talks, she crawls on her belly like a reptile!”). Modern Barkers, not doing much of anything. The rides—cobbled hastily together by people who, in all probability, did not enjoy the benefits of higher education—reeked with their own special kind of danger, and the hairy, tattooed man (or is that a woman?) taking your ticket and eyeing your girlfriend up and down also exuded mild menace. And then you spun and whirled and plunged and soared and screamed your throat raw and it was the biggest rush of the summer and you left feeling elated and not the least bit nauseous, which only the young can do. And so, I brought my wife to the fair, to show her an authentic piece of Americana and relive my childhood memories. You have, no doubt, already anticipated my disappointment. The livestock and local 4-H exhibits—which is supposedly the primary purpose of the fair—were still there, and if they seemed a little smaller than I recall that is probably due to my being larger and the fact that my most recent trip to an agricultural exhibition was the South of England Show. The amusement park, however, was anything but the same. The gaming booths were there but the barkers weren’t. The people running the booths didn’t shout, instead they causally watched the passers-by and chatted amiably with their neighbors. The sideshows were gone, as were the really dangerous rides and my desire to ride them. And the few fair people I encountered were polite and relatively well-spoken. In short, there was no sense of danger, no menace or excitement, and it was nowhere near as tawdry as I remember. It seemed, to my utter dismay, nice. So file this under “You can’t go home,” or “They’re ruining this country,” or “These kids today don’t know they’re born” and go visit the cow barn; that hasn’t changed. We used to have these in England when I was growing up although we didn't call them County Fairs. I do remember the very questionable young men who used to hang on the back of the dodgem/bumpers cars and the goldfish in a bag that never even made it home. Haven't been to one in years. 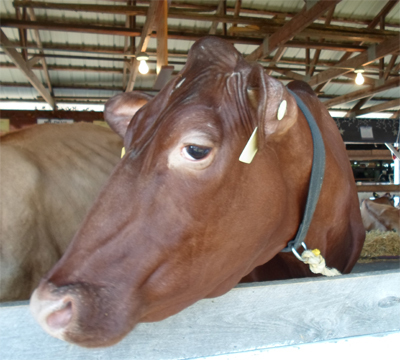 You really need to go to a county fair--a RURAL country fair. That said, I finally got to the south of England show a while back and it was really nice; reminiscent of the agricultural fairs back home, but with more people wearing tweed. That's our county fair. Rides,funnel bread,games, 4H animals(pigeons and rabbits included) AND the famous skillet toss. Also the 4H Farm Queen. A good portion of the Garden State is still farm land and the fairs are gre,at fun! Yes; it wouldn't have been the same without them. I remember going to the county fair when I was a kid. I believe that my great-grandkids enjoy the county fairs just as much as we did because this is their one-and-only childhood. We take what we get when it comes to our childhoods and appreciate it anyway. There are many things I grew up with that they will never know, but they will never miss them. That's a beautiful cow in the picture! The british shows, too, are a lot tamer than they were when I was little. You have ride inspectors and health and safety to blame for that, I suspect - also fewer nomads getting away with not educating their children. My mother used to ban us from going to our local one, it was so bad! But I used to sneak there anyway and I have to admit, there was an edge to it that doesn't exist now. There would be boys running rides who were younger than me, probably only about 10 or 12.